This Blackout Buddy is like the Belkin Battery Backup Flashlight, except without the battery backup. 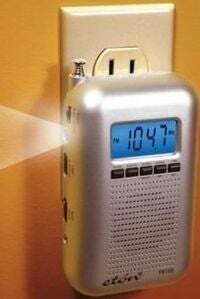 It spends most of its life plugged into the wall, soaking up juice for when the power goes out. When that day comes, you'll get a flashlight that lasts 12-16 hours and an AM/FM radio that lasts 4-8 hours. It's a pretty minimal way of being prepared for an emergency, although you'd probably want to store some water, canned food, and Playboys as well. That's right, you're not going to be able to access the internet when your power's out, smart guy. Always plan ahead.